Liver and onions is a favorite in the UK and in Germany, where it is usually eaten along with boiled or mashed potatoes. Lamb’s liver is the usual choice in the UK and is often accompanied by fried bacon. In the French traditional recipe the liver is fried with butter and lard. In Catalan cuisine olive oil is used, instead of butter, and fried garlic is added to the mixture. In the USA, liver and onions as a dish once enjoyed widespread popularity and could usually be found at family diners and American home-style restaurants. This meal is currently more common to the cuisines of the southern and upper mid-western style foods. 1566 R.I.P. Leonhard Fuchs. He was a German botanist who compiled the first modern, organized listing of plants and botanical terms, ‘Historia Stirpium’ in 1542. The plant and the color fuchsia were named for him. 1818 R.I.P. Paul Revere. A silversmith and American Revolutionary folk hero, he also made surgical instruments and false teeth. 1850 Sir Thomas Johnston Lipton, grocer and tea merchant, was born. 1898 The first vending machine law was passed in Omaha, Nebraska. 1920 R.I.P. John Wesley Hyatt. He developed the process for making celluloid, the first synthetic plastic. He also invented a water purifying system and a sugar cane mill. 2010 A 10 year-old 3rd grade student in Texas was given 1 week’s detention for being in possession of a candy bar at lunch time. The candy bar was also confiscated. Cool article about liver and onions! Yum! Stop your hatin’. Tasty! My mom used to make liver and onions and gravy. LOVE liver and onions. I like to marinate them in a soy sauce and white pepper mix and pan fry them. For me, they have to be served with a squeeze of lemon alongside caramelized onions, just the way my grandmother made them. I also agree that they have to be a little pink on the inside. YUM! Ewwwwl Gross!!!! I can’t stand liver. My parents tried to force me to eat it when I was a kid. Little did they know my doberman pinscher really enjoyed it;) ha! This shouldn’t be allowed. Not because I’m a vegetarian – but because I remember liver and onions as a child. I love liver and onions. I haven’t had it in a while… so.. hmmm thank you for the idea! I adore liver, my most favourite food. I flash fry it sliced very thinly and serve it with a Mushroom, Onion and tomato based sauce. Delish. I feel a blog post coming on……. 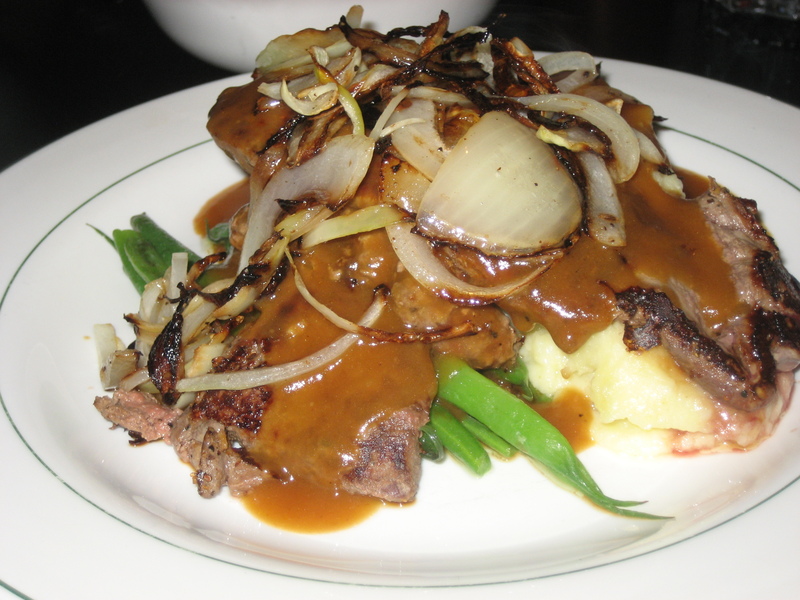 Liver, one of my favorite dishes …. especially calf – it was gone for quite a while, but now made its way back on restaurants menus. Live its .. but I want mine with bacon and capers. Love you photo choice. In the old days we in Sweden put the liver over night in milk – before cooking it – my grandma always did that – and it came out stone dry .. hated liver as a child – I eat it so often I see it on a menu, it has to be slightly pink – otherwise it’s terrible.